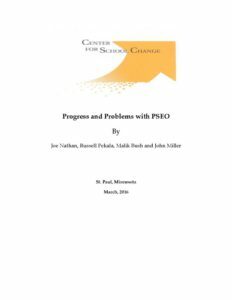 Students and Families Need to Know about PSEO This 2015 report examined what percentage of Minnesota districts and charter public schools were following a state law regarding student and family information about Post Secondary Enrollment Options. The report followed up on legislation that CSC and other groups convinced the 2014 Minnesota legislature to adopt. The 2015 report found that 90% of a stratified random sample of public schools were NOT providing the required “up to date” information. Several newspapers wrote editorials citing this report, and the Minnesota Department of Education wrote to all superintendents and chartered public school directors, reminding them of the laws requirements. A 2016 follow-up, posted below, found that most districts and charters, were following the state law, at least as it relates to providing “up to date” information on their websites. 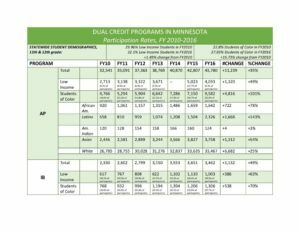 Progress and Problems with PSEO: This 2016 report was a follow-up to the 2014 Minnesota legislation requiring that families and students receive “up to date” information about Post Secondary Enrollment Options. This 2016 report studied a stratified random sample of Minnesota district and chartered public schools. It found that about 90% of them were following the 2014 state law, at least in terms of providing required information on their website. Progress and Possibilities: Trends in Public High School Student Participation with Minnesota’s Dual Credit Programs 2006-2012. This report shows progress and possibilities as the authors ask and answer three key questions. First, what is the value of Dual (high school/college) credit courses? Second, what has happened over the last five years with Minnesota student participation rates in various forms of Dual Credit? Finally, what might be done to encourage more participation in these courses? Trend data comes from the Minnesota Rigorous Course Taking Report. Minnesota Charter and District Demographics and Trends. This is an analysis of data available on the Minnesota Department of Education website. The report was completed in April, 2018 by Aaliyah Hodge, with assistance from Joe Nathan. MN Charter and District School Demographics. 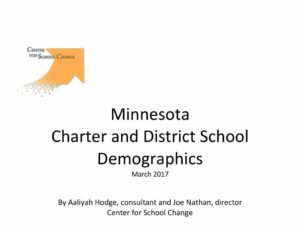 This is the 2017, updated version of a report, covering Minnesota, Minneapolis and St Paul K-12 district and charter enrollment. This report was written by CSC consultant Aaliyah Hodge. This report covers 2001-02 through 2016-17. Summary of State Policies 2013. This paper summarizes a 2013 survey about virtual charter schools in 42 states and the District of Columbia. The survey was carried out to answer three questions that state policy-makers, educators, parents and other people have asked. 1. Do states that permit charter public schools also permit virtual charter public schools? 2. In states where the answer to the first question is “yes,” do virtual charters receive the same per pupil funds from the state as “bricks and mortar” charter public schools? 3. In states that permit virtual charters but fund them differently than bricks and mortar charter schools, what are the broad outlines of the funding system for virtual charters? This is a 2009 issue brief written by the NGA Center for Best Practices and CSC about what states can to to help expand high performing charter public schools. St. Paul Gates Project Here is a link to the final report for this project. A major new study of Minnesota’s Public School Choice Laws, conducted by Penn State University and University of Minnesota educators, reveals important and sometimes surprising developments that could have national implications. The two-year study examined Minnesota’s Post-Secondary Options, open enrollment, Second Chance and charter schools. Examines the questions: How are charter schools assessing student achievement? What are charter schools doing to meet accountability requirements? Are charter schools improving student achievement? Thirty-one charter schools in eight states were interviewed. Twenty-one charter schools in the sample have administered at least two rounds of the same test and appear to be making academic gains. This report summarizes the success of these 21 schools. It also discusses the methods used to assess student achievement and other aspects of accountability such as student behavior and attitudes, parental involvement and school climate. Survey of 110 charter public schools in seven states. The report found that charter school officials’ “number one” request of policymakers is that charter schools be given real autonomy in exchange for their responsibility to improve education. The report also describes lessons learned so far by charter schools, including advice officials would give to policymakers and people considering establishing a charter school.